Cynthia Waters - North Carolina A&T State Univ. Additive Manufacturing, also known as AM or 3D printing, is a class of manufacturing processes that create objects by shaping material layer by layer. Having demonstrated the ability to produce miraculously complex geometries, it is broadly claimed that AM will have endless applications as the technology improves. However, underneath the hype surrounding this technology is a world of nuance and constraints as well as highly strategic applications. 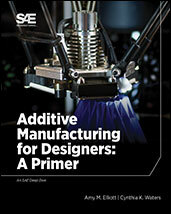 Additive Manufacturing for Designers: A Primer, written by Dr. Amy Elliott from Oak Ridge National Laboratory and Dr. Cynthia K. Waters from North Carolina A&T State University discusses the topics needed for a holistic understanding of the many micro and macro components of the world of 3D printing. Additive Manufacturing for Designers: A Primer takes the reader on a journey beginning with important aspects of AM part design and process dependence, including resolution and tolerance issues of interest to any manufacturer. It also offers useful insights into how to build especially complex parts and avoid expensive mistakes during and after the manufacturing process is completed. If you do not have access to SAE MOBILUS via username/password or institutional access, you can still purchase the Book, Additive Manufacturing for Designers: A Primer.